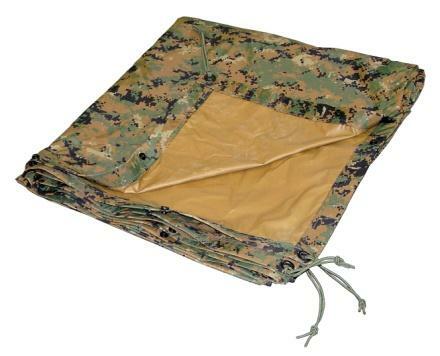 The Field Tarp is an outer protective cloth designed to provide Marines with a lightweight, waterproof covering which will also function as a ground cover, sunshade, gear cover, field litter, personal protection and/or a hasty shelter. 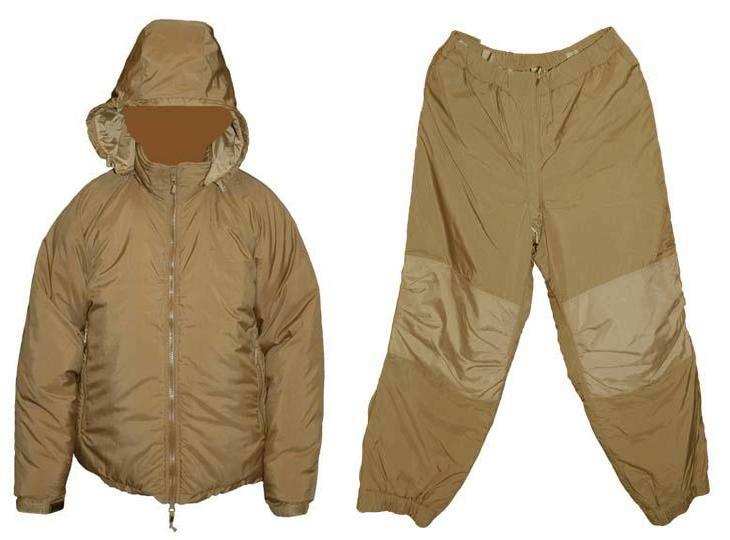 The All Purpose Environmental Clothing System (APECS) parka and trousers were developed to provide Marines with an all-purpose/all-season set of outershell garments that are lighter in weight, lower in bulk, have lower noise generation, are moisture vapor permeable and have an improved water repellency over the 2nd Generation ECWCS parka and trousers. The APECS also incorporates the Marine Pattern. 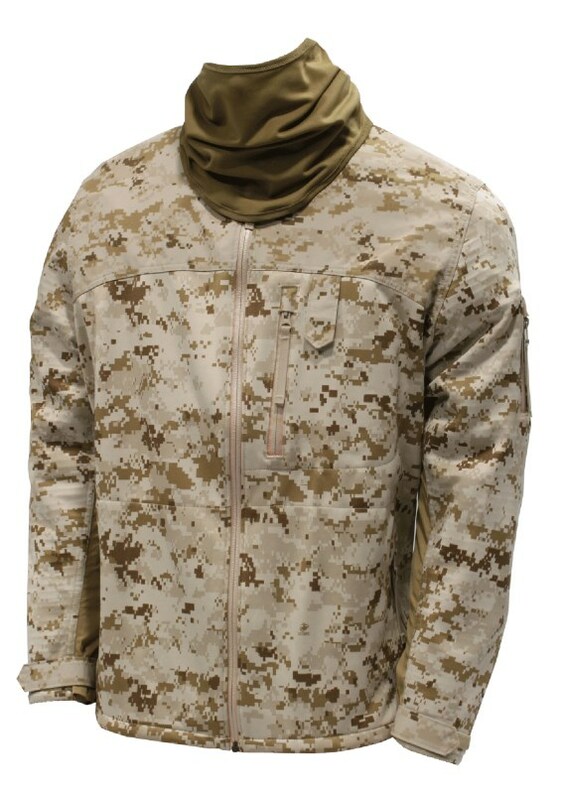 In an effort to meet its ever changing environmental challenges, The Marine Corps has identified a need for a Combat Desert Jacket (CDJ) that will provide protection from the unique environmental nature of the desert. 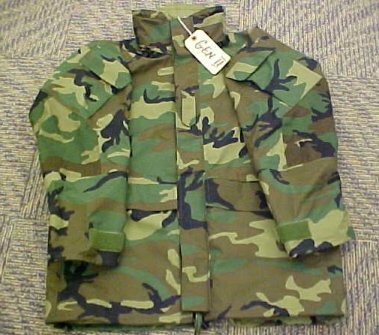 The Combat Woodland Jacket (CWJ) is a woodland version of the combat desert jacket. 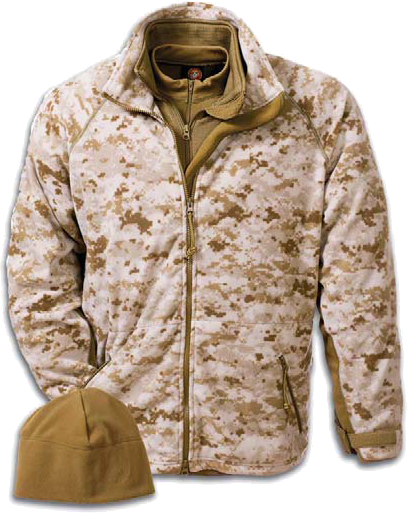 The Mountain/Cold Weather Clothing System (MCWCS) is a Marine Corps specific cold weather layering system (CWLS), a replacement for the ECWCS. 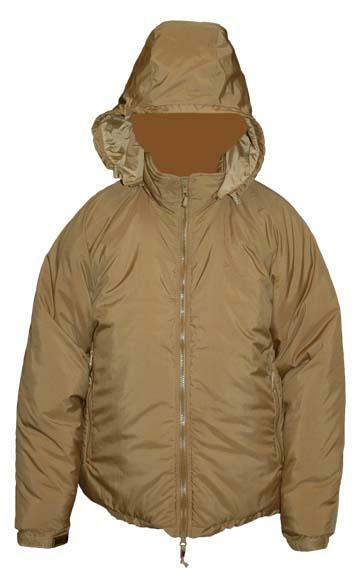 The All Purpose Environmental Clothing System (APECS) parka, together with APECS trousers, was developed to provide Marines with an all-purpose/all-season set of outershell garments that are lighter in weight, lower in bulk, have lower noise generation, are moisture vapor permeable and have an improved water repellency over the 2nd Generation ECWCS parka and trousers. The APECS also incorporates the Marine Pattern. 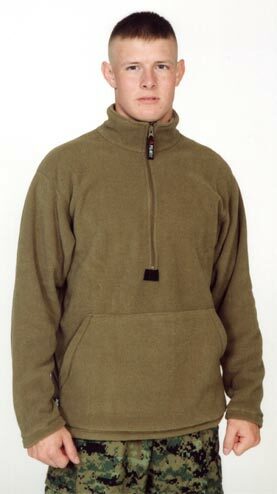 The fleece pullover was developed to provide The Marine Corps with a multi-purpose, lightweight/low bulk, moisture transport, and insulation layer for the upper torso.The fleece pullover can be used during both garrison and field duties in cool to cold weather conditions.It can be worn under the camouflage utilities, used as a sleep shirt in the sleeping bag, and as an optional/additional insulation layer for the ECWCS. 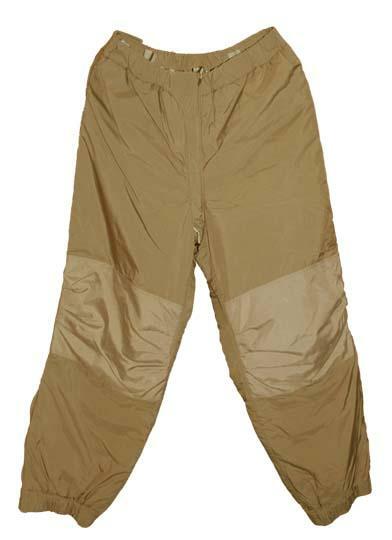 The All Purpose Environmental Clothing System (APECS) trousers, together with APECS parka, were developed to provide Marines with an all-purpose/all-season set of outershell garments that are lighter in weight, lower in bulk, have lower noise generation, are moisture vapor permeable and have an improved water repellency over the 2nd Generation ECWCS parka and trousers. The APECS also incorporates the Marine Pattern. 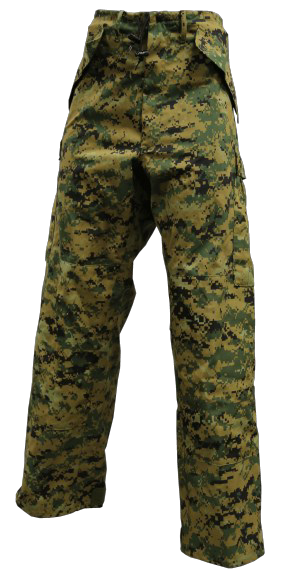 The 2nd generation parka and trousers incorporates features requested by Marines. 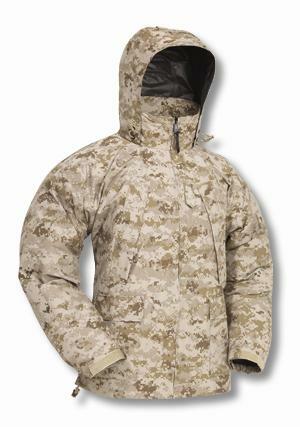 Improvements over the original parka and trousers include a two-way entry pocket design, water channels to protect critical area from potential leakage, removal of the taffeta nylon lining to reduce cost, improved breathability, a roll and stow hood, and a Cordura nylon reinforcement of the elbow and knee areas to improve durability. The ECW booties, together with the ECW parka and trousers, are designed for bivouc, rest and sentry activities in mountain conditions. 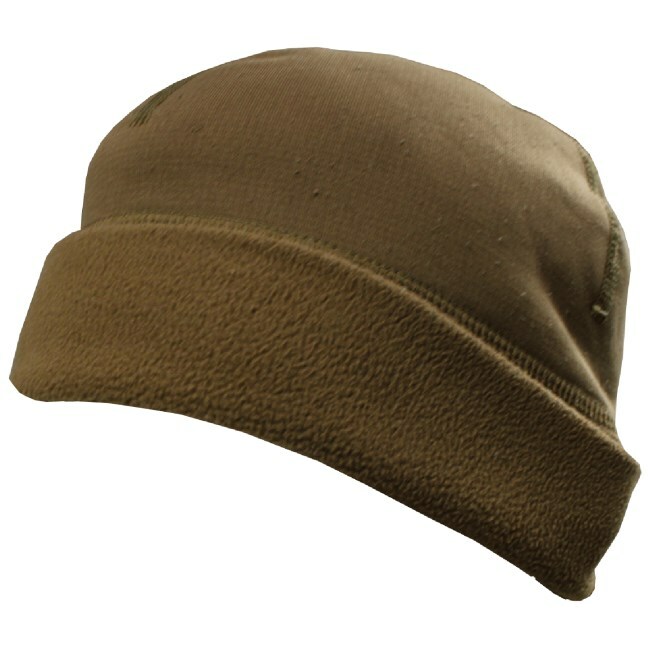 The hardface micro fleece cap is intended for wear by male and female military personnel of the USMC in mountainous and cold weather environments.It will provide improved wind resistance, durability and water repellency when worn in intermediate to cold weather environments.It will be part of the Mountain/Cold Weather Clothing System and will ultimately replace/phase out the current micro fleece caps. 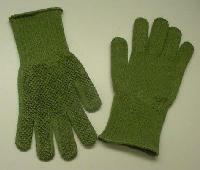 The light duty flame resistant glove insert is designed to be worn either alone or under a mitten or glove shell. The ECW parka and trouser overgarments and booties are designed for biouvac, rest and sentry activities in mountain conditions.The garments shall be lightweight and easily packed to a minimum volume to be carried among the variety of other mission essential gear. 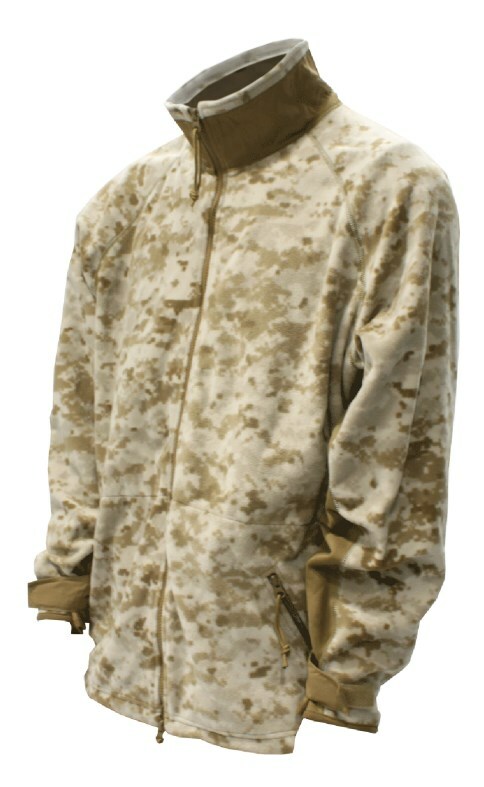 The windpro fleece jacket is intended for wear by male and female military personnel of the USMC in mountainous and cold weather environments.It will provide improved wind resistance, breathabilty and water repellency when worn in intermediate to cold weather environments.It will be part of the Mountain/Cold Weather Clothing System and will replace the current fleece jackets. The lightweight exposure jacket, together with the lightweight exposure trousers, is designed for wind and rain protection in mountain conditions. The lightweight exposure jacket and trousers are designed for wind and rain protection in mountain conditions. 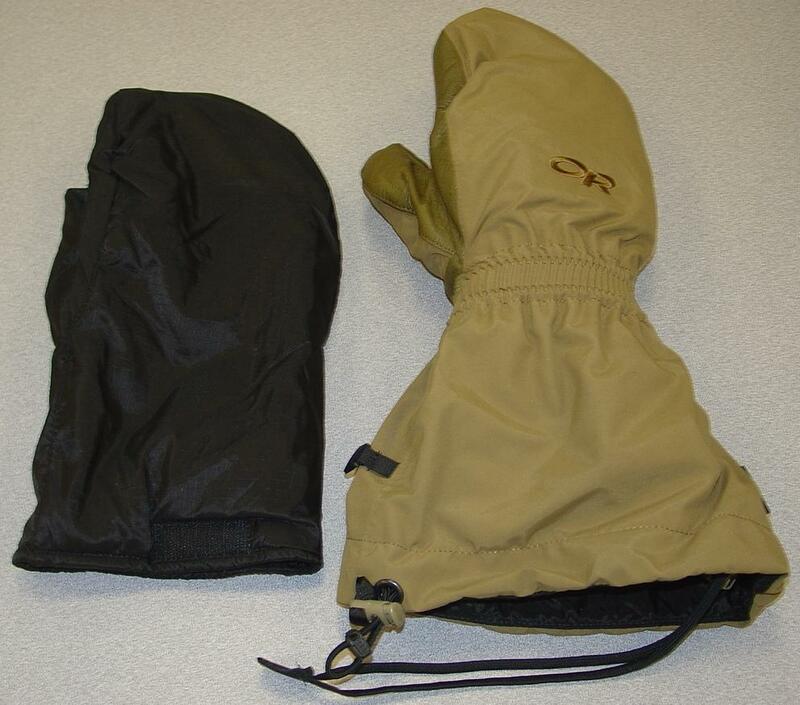 The Marine Corps has developed an Extreme Cold Weather Mitten System including a Mitten Shell with Removable Liner and Light Duty Flame Resistant Glove Insert, which will provide improved environmental protection over USMC's previous mitt, the insulated trigger finger mitt. The ECW parka, together with the ECW trousers and booties, is designed for bivouc, rest and sentry activities in mountain conditions. 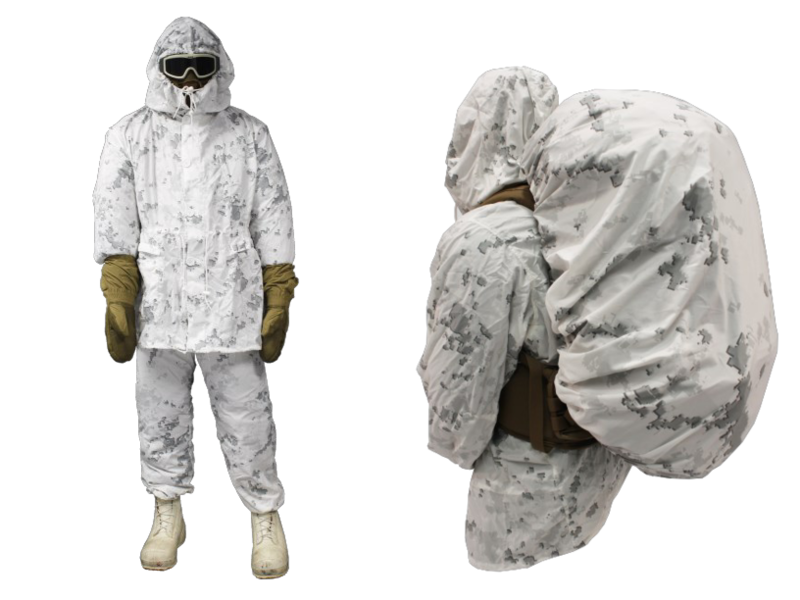 The snow camouflage parka, trousers and pack cover are designed to be worn as over-garments when snow camouflage protection is required. The lightweight exposure trousers, together with the lightweight exposure jacket, are designed for wind and rain protection in mountain conditions. The ECW trousers, together with the ECW parka and booties, are designed for bivouc, rest and sentry activities in mountain conditions. The mid-weight FR grid fleece underwear is a flame resistant version of the polyester grid fleece underwear.It will provide improved moisture management, insulation and comfort when worn in intermediate to cold weather environments. In addition, it will provide Marines with FR protection when needed. 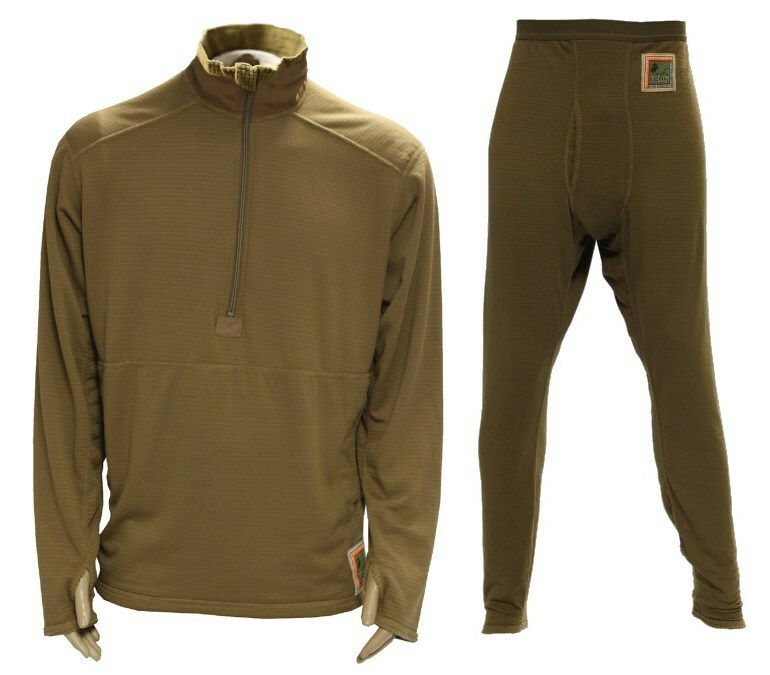 The FR Grid Fleece can be worn as part of the Mountain Cold Weather Clothing System or Flame Resistant Organizational Gear (FROG). 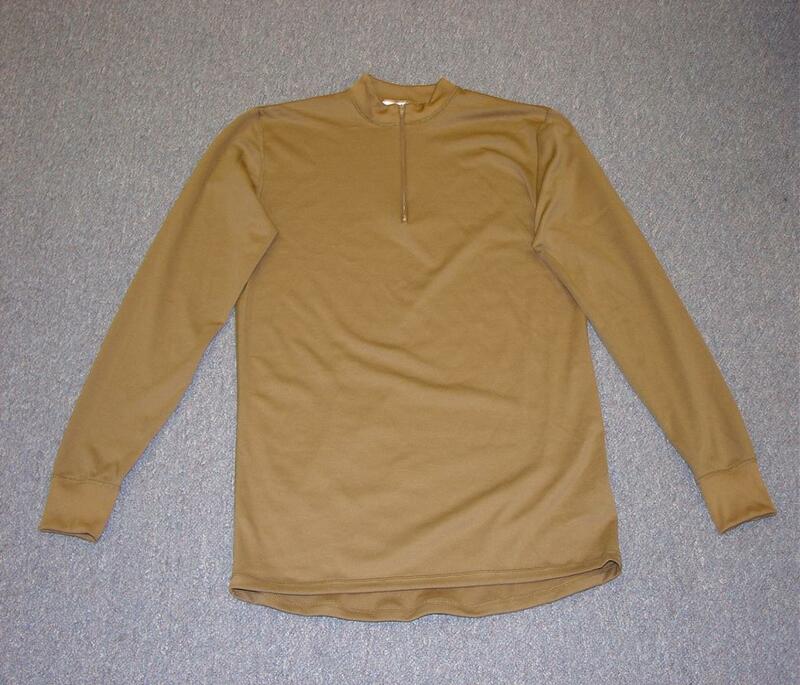 The mid-weight grid fleece underwear is intended for wear by male and female military personnel of the USMC in mountainous and cold weather environments.It will provide improved moisture management, insulation and comfort when worn in intermediate to cold weather environments.It will be part of the Mountain/Cold Weather Clothing System and will replace the current polypropylene underwear set, and fleece pullover. The FR next-to-skin underwear is a flame resistant version of the polyester silkweight underwear.It will provide improved moisture management and comfort when worn in intermediate to cold weather environments. In addition, it will provide Marines with FR protection when needed. 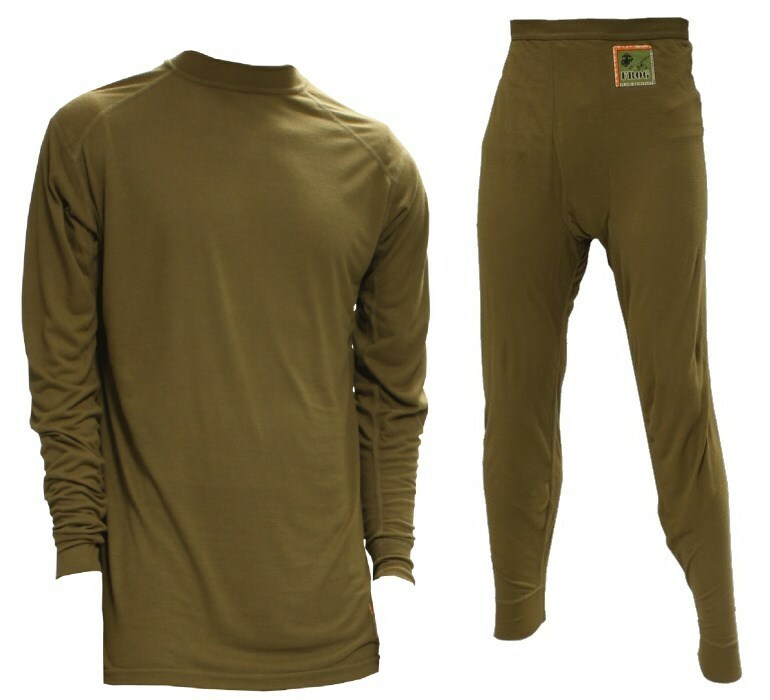 The FR Silkweight Underwear can be worn as part of the Mountain Cold Weather Clothing System or Flame Resistant Organizational Gear (FROG). 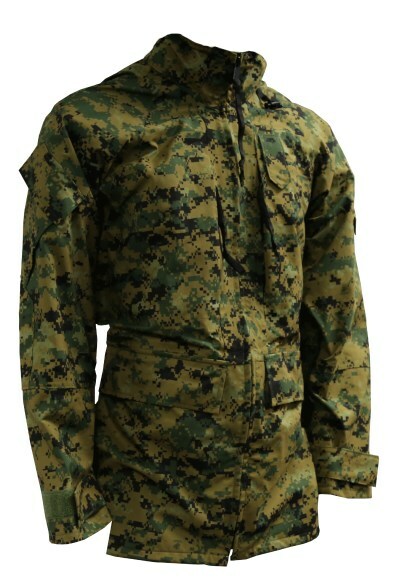 The new next-to-skin underwear is intended for wear by male and female military personnel of the USMC in mountainous and cold weather environments.It will provide improved moisture management and comfort when worn in intermediate to cold weather environments.It will be part of the Mountain/Cold Weather Clothing System and will also replace the current lightweight CW underwear set. Due to the threat of burn injuries stemming from OIF/OEF, a USON was established that required burn protection for the hands and face/neck. After extensive testing, it was determined that in addition to providing base layer of flame/fire protection, an outer layer of protection is essential. The FROG balaclava has a hinged face guard that allows wearer to expose face without having to remove helmet and balaclava. It is issued in light and mid weight materials for different seasons. 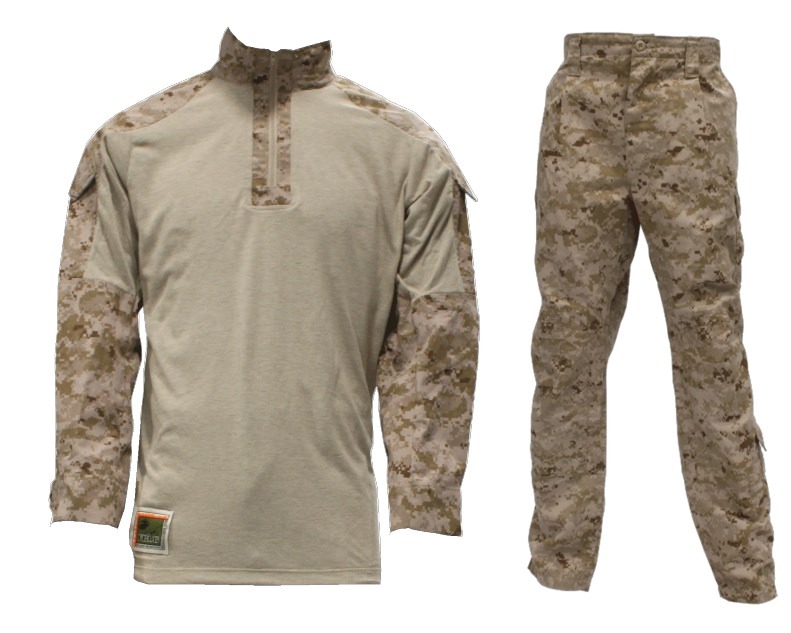 The Enhanced Flame Resistant Combat Ensemble (EFRCE) consists of a blouse and trousers that make up a set. 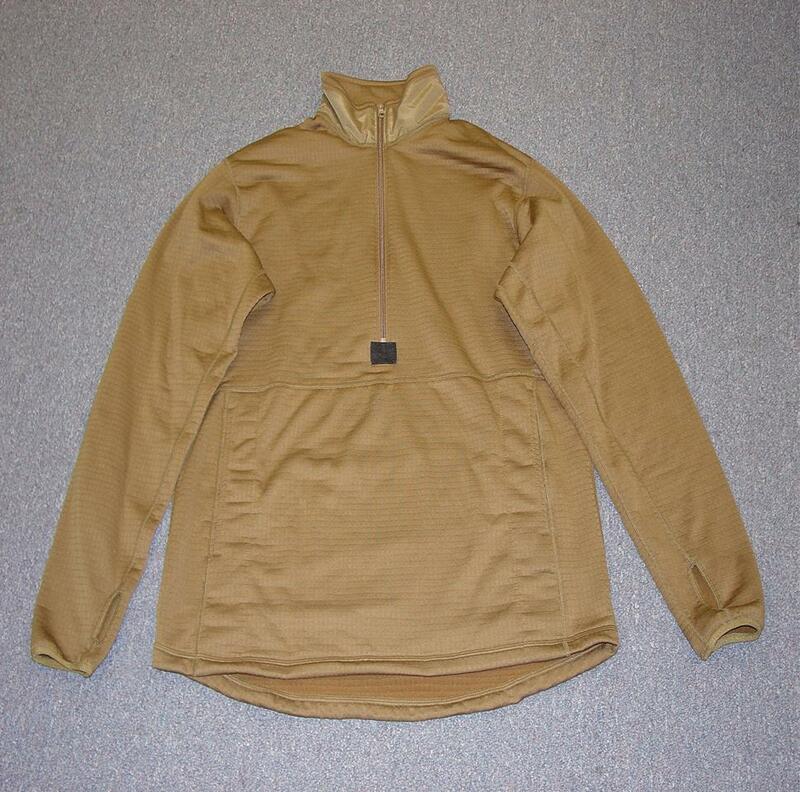 Although the EFRCE is similar to the current Flame Resistant Combat Ensemble, the design and fabrics used to construct the ensemble have been modified to increase durability. The Flame Resistant Combat Ensemble is comprised of a high performance protective blouse and protective trousers that will provide the protection, safety and comfort features required by Flame Resistant Organizational Gear. The inclement weather combat shirt is a pullover shirt that will provide FR protection as well as protection from wind and water. It is designed to be worn over the combat shirt as a component of FROG. 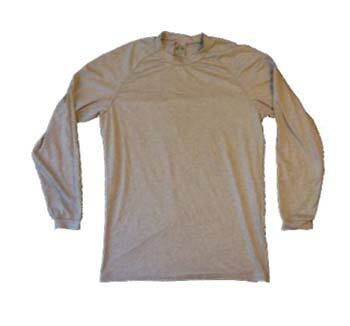 In addition to being FR, this shirt has a mock neck design for added protection and also contains an antimicrobial property along with moisture management (wicking) capabilities. 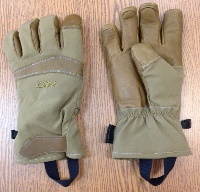 The cold weather contact gloves allow Marines to conduct precise technical work such as operating computer and electronic equipment while protecting their hands from the cold weather combat environment. 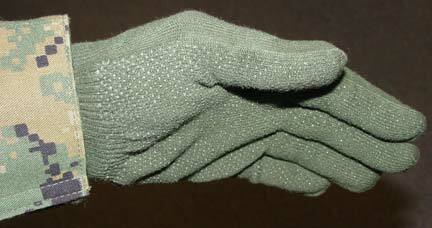 Improved Glove Inserts are worn alone, or worn under the Light Duty Glove. The Light Duty Glove Insert is a product improvement replacing the Improved Glove Insert.The intent is to eliminate the melt/drip hazard, which could occur with the old polyester/lycra insert, by changing to a cotton/lycra insert. The USMC Intermediate Cold Weather Glove is designed to be worn in cold weather environments to protect the user from the elements including snow, wind, and ice. The improved cold weather trigger finger mitten is light weight, reduced bulk, hydrophobic, quick drying, and designed with a trigger finger for weapon operation.The mitten is intended to be used in temperatures ranging from +10 to -25°F (-12 to -32°C). The mitten is compatible with the snow camouflage mitten shells and improved glove insert, and replaces the trigger finger mitten shells and inserts. 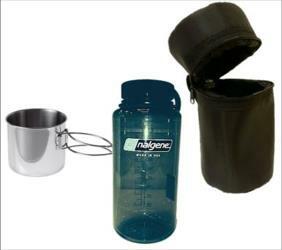 The Cold Weather Hydration Set (CWHS) consists of two wide mouth 32 oz. bottles with lids, two water bottle parkas with strap, and one cup. CWHS provides Marines a lightweight capability to carry and protect water from potentially harmfully contaminates, while also extending the temperature of the liquid. Additionally, the cup will provide a means to prepare food, drink and/or boil water. The Marine Corps Close Quarters Battle Equipment (CQBE) consists of the assault suit, assault vest system, individual assault kit, assault gas mask, assault breacher kit, and assault breacher torch kit. Family of Improved Load Bearing Equipment (FILBE) utilized by the United States Marine Corps is designed to allow Marines to carry equipment needed in support of combat operations. The load bearing erquipment system is modular in order to meet the unique needs of the warfighter. The system will maximize the ability to carry combat loads efficiently, minimize the burdens of weight, improve overall system compatibility and increase the combat effectiveness of the user. Full Spectrum Battle Equipment (FSBE) reduces the component weight, provides a single point of release mechanism, and has an integrated breathing and flotation system. 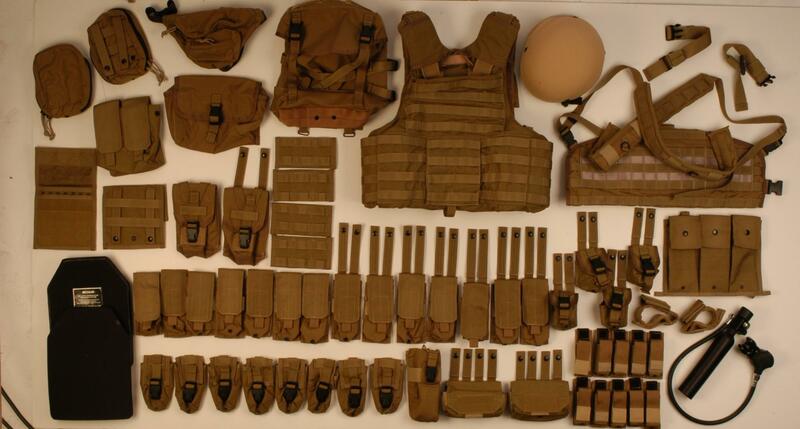 FSBE replaces the Close Quarters Battle Equipment (CQBE) Assault Vest System (AVS). The Improved Load Bearing Equipment (ILBE) is a load carrying system designed to provide a durable and lightweight means for the deployed Marine to transport individual combat clothing and equipment, and replace MOLLE. 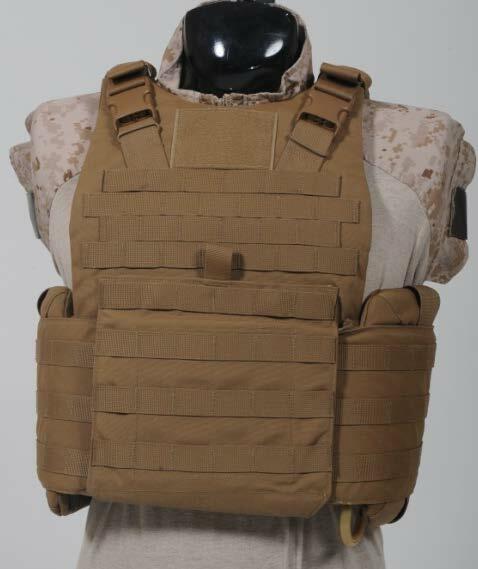 The assault vest system (AVS) provides the individual Marine with ballistic protection and/or load bearing capabilities necessary for conducting close quarters battle (CQB) missions. 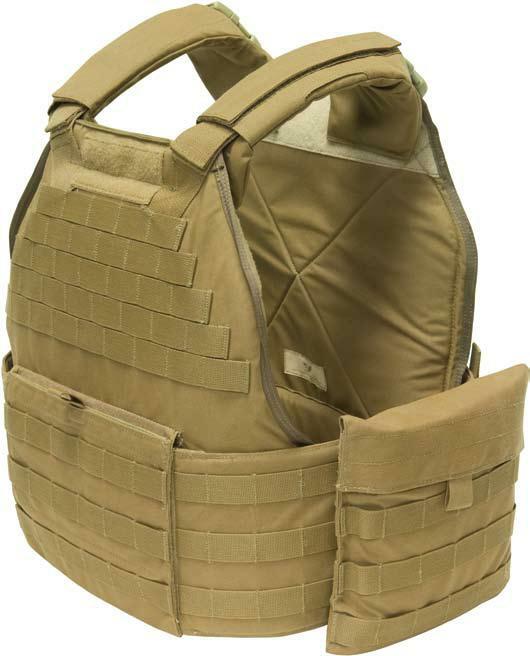 The assault body armor component of the assault vest system (AVS) exceeds the National Institute of Justice (NIJ) Standards for Type IIIA and provides protection from multiple impacts of steel-jacketed 9mm, 123 gr. rounds traveling at 1445 fps and all lesser threats. 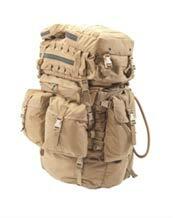 The assault load bearing vest provides a means of carrying mission equipment that allows evenly distributing loads. 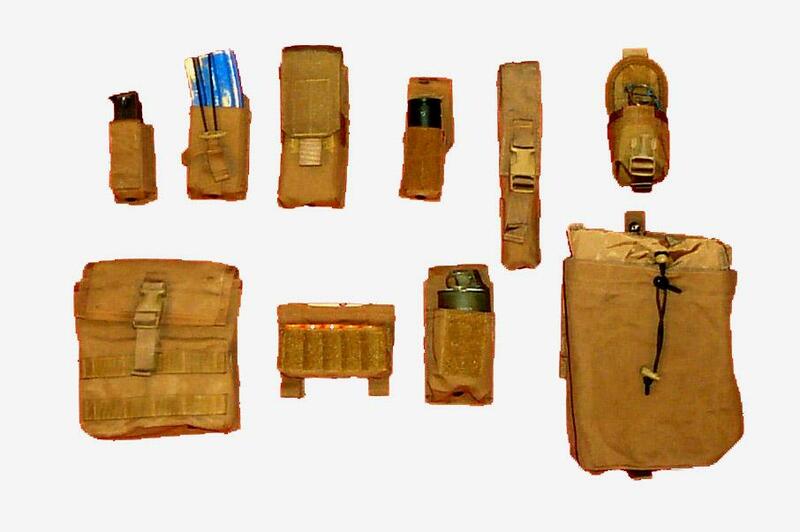 The modular design allows use of different pouches in varying locations to adapt to different assigned tasks, weapons, equipment and left or right handed individuals. The vest may be worn over the assault body armor (ABA). 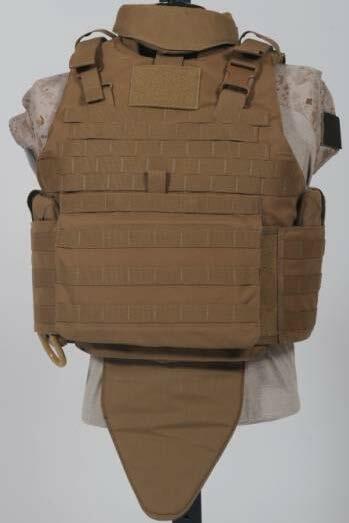 The USMC Chest Rig is a Marine Corps specific modified version of the U.S. Army's Tactical Assault Panel. 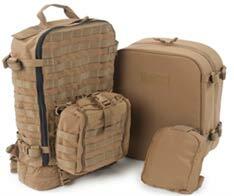 The Corpsman Assault Pack (CAP) is an improved design to replace the previously fielded MOLLE Medical Bag. The Corpsman Assault System (CAS) is specifically intended to provide the Corpsman with a load carriage system that fully integrates with the USMC Pack and currently fielded body armor systems. The Grenadier Set is a suite of three 40mm grenade pouches and one 40mm Grenade Multi-Round System (GMRS) to support the standard combat load for a Marine grenadier. The pouches are Commercial-Off-The-Shelf (COTS) and are part of the Family of Individual Load Bearing Equipment. 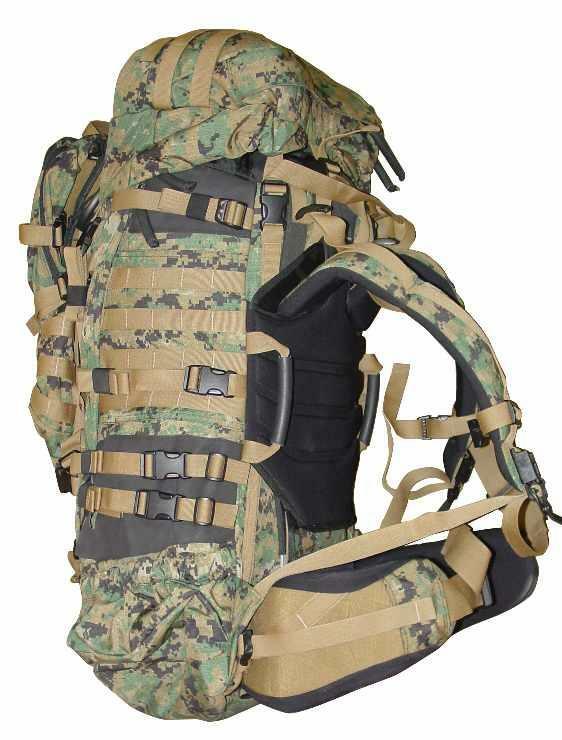 The USMC pack system is specifically intended to provide the Marine with a load carriage system that fully integrates with currently fielded body armor systems. As a critical element of the Marine's individual load,the ILBE pouches provides a stable platform for thecarriage of equipment and supplies needed across thespectrum of individual and unit operations. 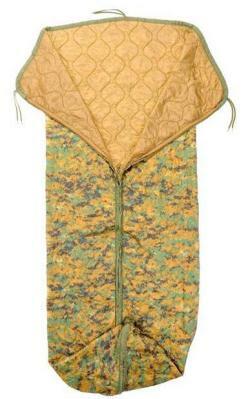 The ILBEpouches are a series of robust, specialized pouchescapable of carrying the basic ammunition loadrequired to support and sustain the individual Marineduring combat operations. After Action Reports from Operations Iraqi Freedom and Enduring Freedom demonstrated a compelling need to provide a waterproof bag to protect personal gear from the elements, rain, sand, snow, and moisture. The Marine Corps Stuff Sack will provide Marines a better method of waterproofing and sorting their personal gear stored inside the ILBE packs. The USMC sub-belt integrates with Family of Individual Load Bearing Equipment components without causing interference and allows individual equipment items to be securely attached via Pouch Attachment Ladder System (PALS). 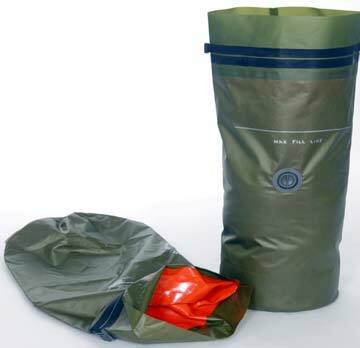 The purpose of the waterproofing bag insert/liner (WPI) is to keep clothing and equipment dry when the ILBE main/assault pack is exposed to prolonged rain or water submersion during field use. The helmet cover is reversible (MARPAT woodland and desert camouflage pattern) and can be worn in both desert and woodland environments. The Lightweight Helmet (LWH) replaces the PASGT helmet.The LWH provides protection in various operating environments from fragmentation and 9mm small arms projectiles. The Improved Modular Tactical Vest (IMTV) provides a number of features that improve upon mission performance, user comfort, and improved load carrying capability when compared to the existing Modular Tactical Vest including: modified removable ballistic panel pattern to provide more acceptable body coverage and protection; improved ergonomics, mobility, and fit at the shoulders; improved cummerbund design; improved comfort utilizing a lumbar pad support; and increased PALS footprint for load carriage. The IMTV provides protection from conventional fragmenting munitions and multiple hits from 9mm handgun rounds. 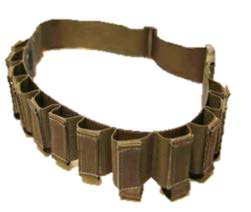 The IMTV protection is increased to protect vital organs against multiple hits from small arm rifles and indirect fire flechette when front, back, and side small arms protective inserts are worn. 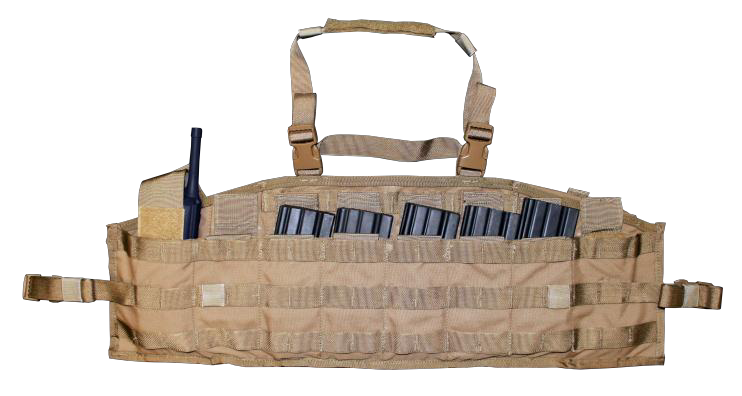 The Modular Tactical Vest (MTV) was developed due to combat operations highlighting the need for operational enhancements to the Outer Tactical Vest (OTV).The OTV, developed in the late 1990's, was not designed to carry heavy loads such as ammo pouches, radios, water carriers and accessories, so many troops either attached cumbersome pockets to the vest or wore an additional load-carrying layer. 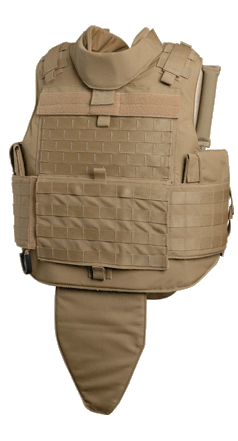 The Plate Carrier (PC) improves the load bearing capabilities of the scalable plate carrier, integrates primary components among the improved modular tactical vest, and contours the product for comfort and wear. 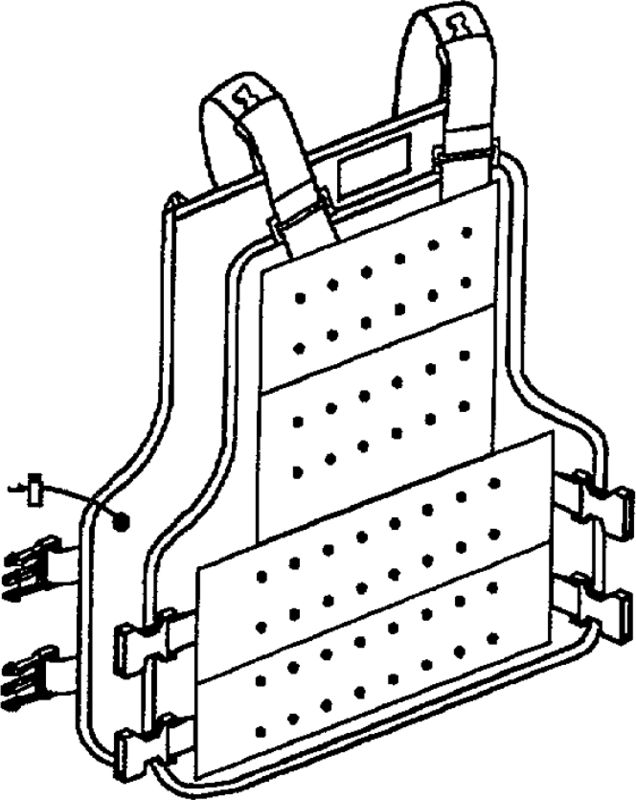 The Scalable Plate Carrier (SPC) is used as an additional ballistic vest, not to replace the Modular Tactical Vest (MTV), but to provide additional warfighting effectiveness by allowing greater maneuverability, agility, and mobility with reduced thermal stress in high elevations, thick vegetation, and tropical environments than that provided by the Outer Tactical Vest/MTV. The SPC offers the same level of ballistic protection as the MTV but reduces overall weight by reducing area coverage for fragmentation. The Marine Corps Plate Carrier Generation III improves mobility and fit of the legacy Plate Carrier. 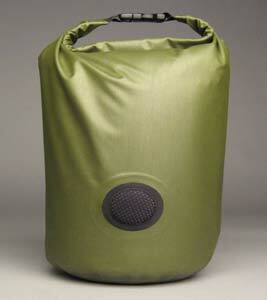 The all purpose liner (APL) is a poncho liner equipped with a zipper closure. 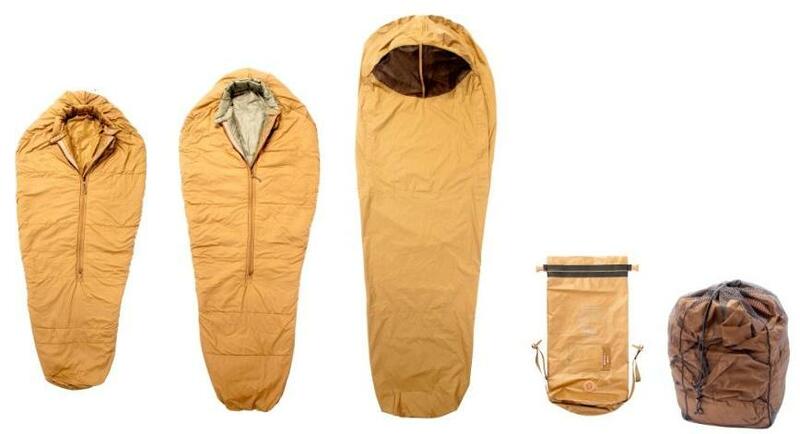 The 3 season sleep system (3S) is a single sleeping bag system that is lighter in weight and provides increased environmental protection for all environments except extreme cold weather. 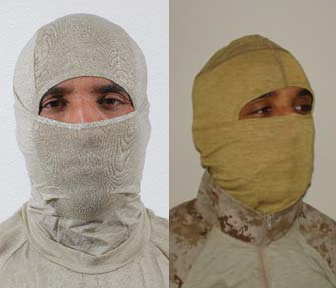 In 2002, the Marine Corps developed a new pixelated camouflage pattern for use in utility uniforms. 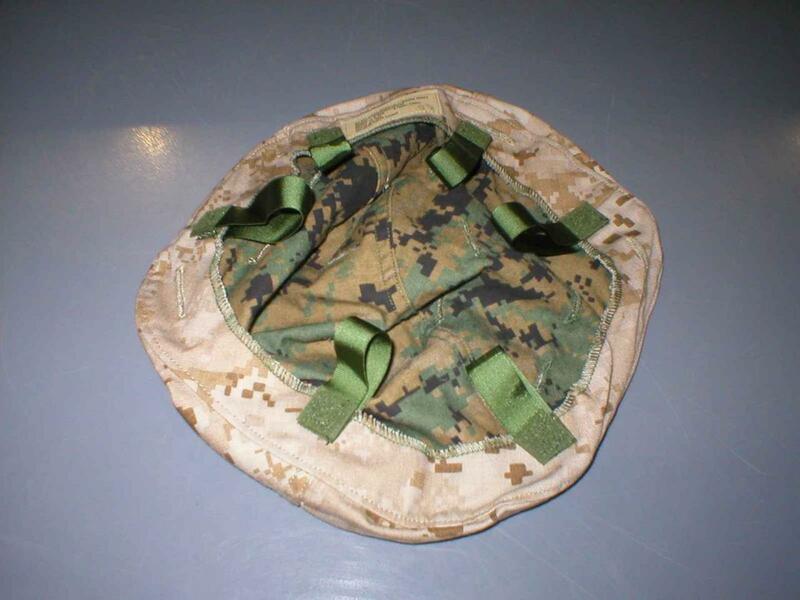 Technical manual 08744B-12&P covers the basic fitting and use instructions for the Marine Corps Lightweight Helmet. Detail specification MIL-DTL-32117 covers the requirements for the helmet covers that are worn over the Marine Corps Lightweight helmet, and the Personnel Armor Systems, Ground Troop (PASGT) helmet, and the Modular Integrated Communications Helmet (MICH). Detail specification MIL-DTL-32157 covers the requirement for APECS parka and a detachable (optional) hood. 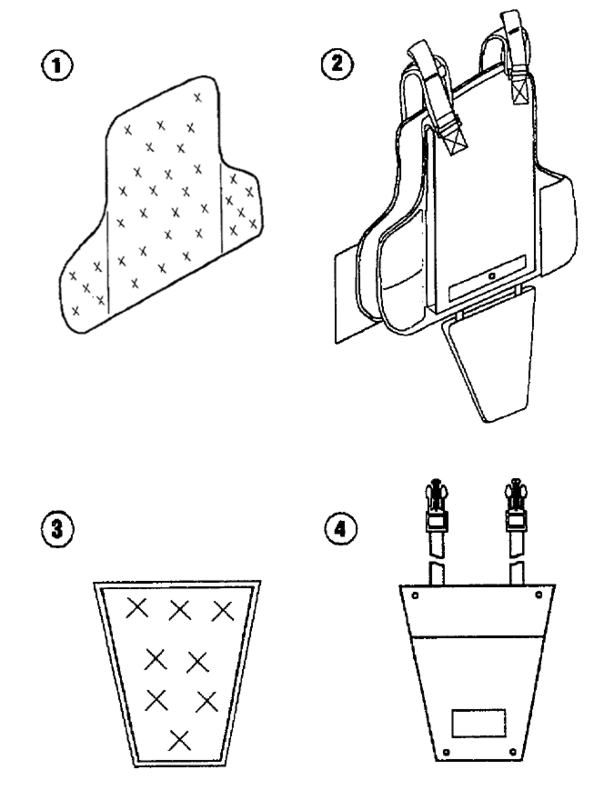 Detail specification MIL-DTL-32158 covers the requirement for APECS trousers. Performance specification MC/PD 1-2014 SYSCOM covers the requirements for the U.S. Marine Corps Intermediate Cold Weather Glove. 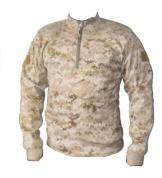 This item is intended for wear by military personnel of the Department of Defense during cold weather conditions. 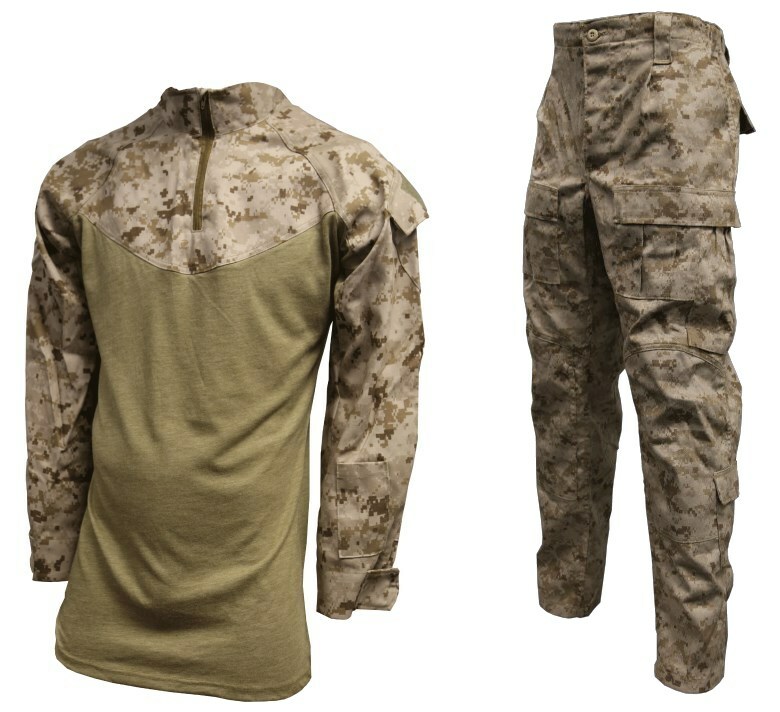 Performance specification MC/PS 01-2015 SYSCOM prescribes the performance requirements and identifies verification procedures for the U.S. Marine Corps flame resistant lightweight cold weather underwear set undershirt. Performance specification MC/PS 02-2015 SYSCOM prescribes the performance requirements and identifies verification procedures for the U.S. Marine Corps flame resistant lightweight cold weather underwear set drawers. 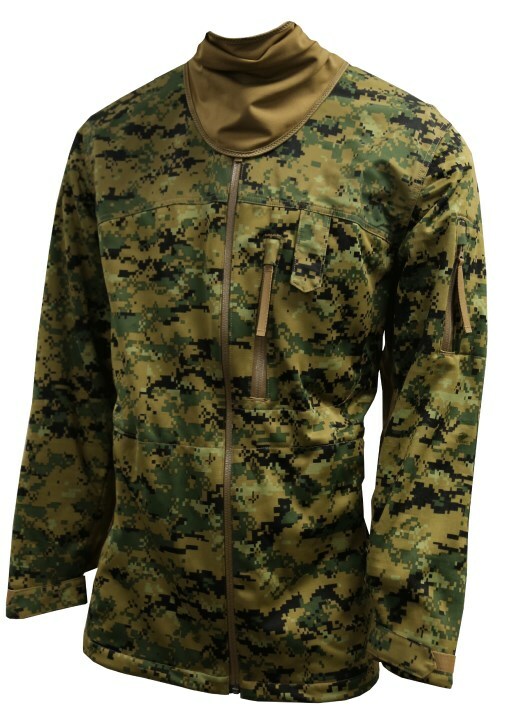 Performance specification MC/PS 03-2015 SYSCOM prescribes the performance requirements and identifies verification procedures for the US Marine Corps flame resistant midweight cold weather underwear set pullover shirt. Performance specification MC/PS 03-2015 SYSCOM prescribes the performance requirements and identifies verification procedures for the US Marine Corps flame resistant midweight cold weather underwear set drawers. 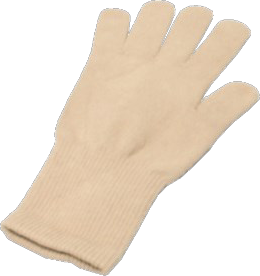 This performance specification covers the requirements for the Marine Corps Light Duty Flame Resistant Glove Insert which can be worn under a glove or mitten. 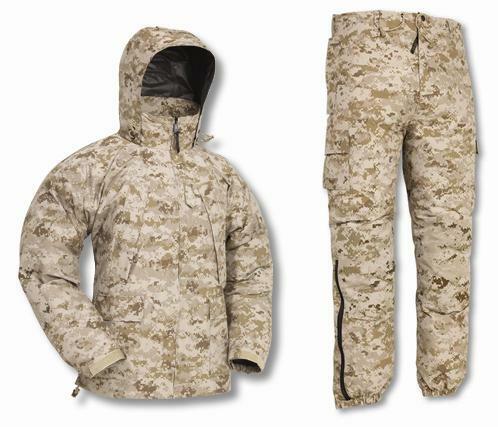 This performance specificaiton covers the requirements for the Marine Corps snow extreme cold weather (ECW) parka and trouser overgarments and bootie for biouvac, rest and sentry activities in mountain conditions. 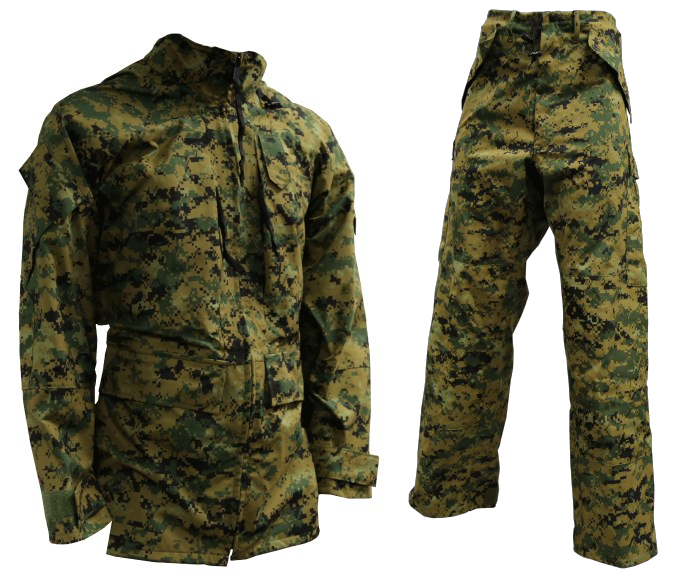 This performance specification covers the requirements for the Marine Corps lightweight exposure jacket and trousers. 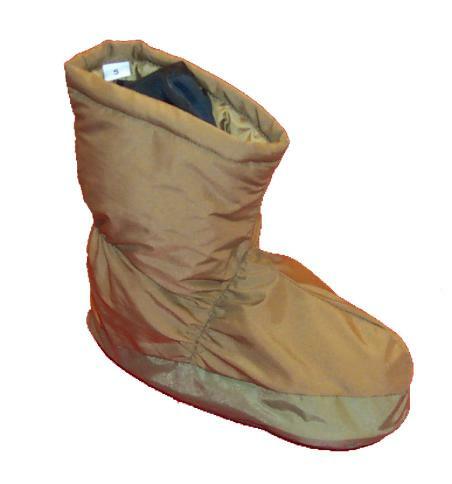 This performance specification covers the requirements for the Marine Corps Extreme Cold Weather Mitten System with Insulated Removable Liner.